Michael Morgan got to blow out his candles and share the cake last Friday at the Paramount Theatre, in a program he designed as a treat to himself for his 20th year anniversary with the Oakland East Bay Symphony. Before lifting his baton he turned to the audience and spoke on the “Night at the Opera” program. Apparently, his treat was getting to see other artists have a blast, an ingredient for good conductors and successful parties. But there was a logic present: the Bay Area’s high caliber of homegrown talent. Choosing local cream over World-wandering imports highlighted Morgan’s dedication to our music scene, and his tenure has benefitted local education. MUSE, his program that sends professional musicians into music classrooms, currently serves 3,000 students at 18 East Bay schools. Additionally, he makes Symphony dress rehearsals free for students and low-income aficionados, and maintains a busy calendar of school visits and Young People’s Concerts. Friday’s program began with Carl Maria von Weber’s Overture to Der Freischütz, and it held special significance for Morgan. “Weber’s Overture is the first piece I ever did as a professional conductor.” French horns entered with the theme, an ensemble sound so plush you could sink into it and have trouble getting back up. The orchestra kept each strand uncluttered—clear tremolos in the violas, and then deep vibratos in the cellos. Weber’s vision of grandeur had a nimble quality, much like Beethoven’s balance of heroic tutti with intimate solos. There was a moment when trumpets and winds finished a sharp volley and we were left with a lone oboe, whose insistence gentled to private thoughts. A parade of singers and arias followed. Tenor Kalil Wilson sang “Lonely House” from Kurt Weill’s Street Scene with unbending fragility, opening to the emotions of the text. Heidi Moss tossed off “Je marche sur tous les chemins” from Jules Massenet’s Manon. The orchestra, careful to stay under her voice, waited for the ends of notes to bellow encouragement. Too agile to be sultry and too demure to be wanton, her provocative phrases were answered wholeheartedly by the men of the Oakland Symphony Chorus. But the high point of the program, and what the audience was apparently waiting for, was the entrance of Hope Briggs, an extraordinary soprano and home town darling. And she certainly did not disappoint, choosing a star vehicle to tackle: “Pace, pace mio Dio!” from Giuseppe Verdi’s La Forza del Destino. Effortlessly filling the Paramount’s mighty hall, she showed us the succulent hues of her voice in this prayer for a final release. And not only was the sound gorgeously rich, but each note was sculpted with a delicacy which belied her muscle. The soft unfurling of the first “pace” made us hold our breath, but her powerhouse ending left the audience shouting. At least two more high points made the evening, Joshua Bloom’s deep and agile bass in the “fairy godmother” role from Cinderella in Rossini’s opera version, La Cenerentola. Bloom reached deep for an acrobatic rumble reminiscent of a young Samuel Ramey. And Assistant Conductor Bryan Nies took the podium for one of opera’s big moments, “Siegfried’s funeral music” from Richard Wagner’s Götterdämmerung. There was a transparency to his conducting, as if he was following Wagner rather than leading musicians. The horns were exceptionally clean, and the basses were splendidly dirty, laying the formwork for some compelling stuff. Solemn and uplifting, this funeral march was hair-raising. The other excellent soloists were tenor AJ Glueckert and baritones Zachary Gordin and Brian Leerhuber, who played the lovelorn Pierrot from Korngold’s Die Tote Stadt, ending with soft, dreamy high notes and bringing sighs from the audience. The choral moments required an attentive Oakland Symphony Chorus, well prepared by Lynne Morrow and amped up with the addition of the Oakland East-Bay Gay Men’s Chorus. 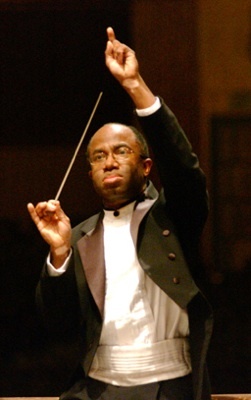 Information on Oakland Symphony’s upcoming concerts is at www.oebs.org.